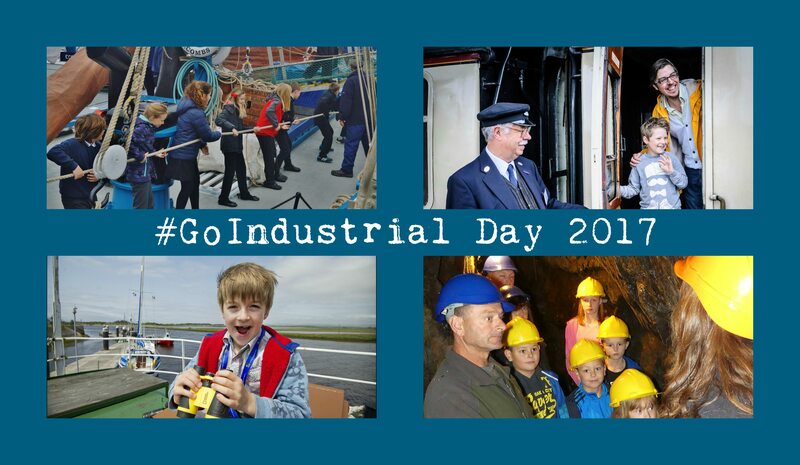 Join us on #GoIndustrial Day on Sunday 6 August 2017 to celebrate the best of Scotland’s Industrial Heritage on Go Industrial Day. At 12noon we'll be making a big noise for our LOUD LAUNCH! Be part of the fun! At Almond Valley Heritage Trust - featuring the Museum of the Scottish Shale Oil Industry - watch out for the train and tractor having a chat at 12noon on #GoIndustrial Day! Auchindrain Township where the air will fill with the clatter of a Ferguson TEF20 tractor working with a Ferguson 5A-EE finger-bar mower! Discovery Point and the RRS Discovery will ring eight bells aboard Discovery at 12noon! Be there in person to be in with a chance of winning an exclusive #GoIndustrial pin and Discovery Point family pass. Take part in the Museum's treasure trail and be in with a chance of winning a goodie bag. Scottish Fisheries Museum where you can try your hand at pewter casting! At Scottish Maritime Museum join us at the habourside where the Kyles will be running at 12noon for #GoIndustrial Day! Have a go at crafts in the afternoon. National Mining Museum Scotland where you can listen out for the sound of the Pit Hooter at 12noon! Spend the afternoon dressing up – don’t forget to tag #GoIndustrial in a picture online! New Lanark World Heritage Site will ring the mill bell for #GoIndustrial Day! Don’t forget to visit the fantastic Brick City exhibition on #GoIndustrial Day! Museum of Scottish Railways at Bo'ness & Kinneil Railway where you can watch the 1210 train depart the station in some serious steam train style! At Summerlee Museum of Scottish Industrial Life the air will fill with the noise of our mighty colliery winding engine in operation. Join us for us fun activities, explore the coal mine and take a ride on one of our vintage trams. Verdant Works will fire up its Boulton & Watt enginge at 12noon! Be there in person to be in with a chance of winning an exclusive #GoIndustrial pin and Verdant Works family pass. Take part in the Museum's treasure trail and be in with a chance of winning a goodie bag! Find out more about our venues, and how to get there, elsewhere on this site. We are a dynamic group of industrial museums in Scotland who are collectively known as Go Industrial. Our aim is to ensure that Scotland's amazing industrial heritage continues to play an important role in our rich culture, and serves to inspire the future whilst safeguarding the past. Find out more. #GoIndustrial on Sunday 6 August 2017!